Here's my collection of RED lippies! I still wear them eventhough its summer! 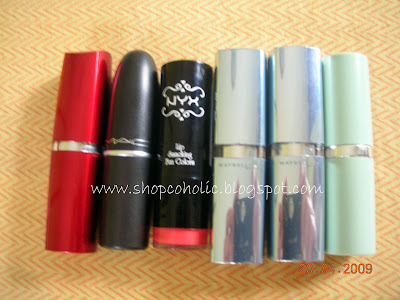 My fave is Maybelline's Empire Rouge & MAC Red, its non-drying and the staying power is good. Unlike the Watershine variant that fades after a few hours, and not that moisturising too! 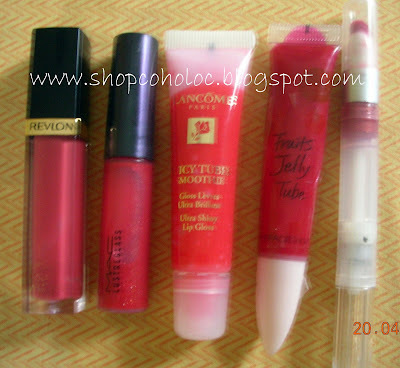 My favorite among the bunch is the Lancome JT! It applies sheer at first then darkens a bit after awhile. Very glossy and a natural red on me! Just like bitten lips.. I'm a bit disappointed with MAC Venetian, it quickly fades and you're left with glossy lips with no color! Its so weird coz its quite pigmented in the tube and on MAC website. 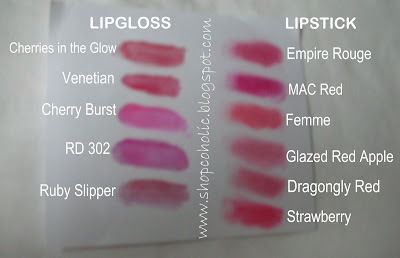 I noticed that MAC Lustreglasses are very sheer when applied, get the Tinted Lipglass if you want pigmented glosses! This is really important to keep lipstick last longer and prevents it from bleeding. RED lipstick on your teeth?! NOT COOL! 1. Make sure your lips is dry (no lipbalm coz this will just make your lipstick slide off). 2. Fill in your lips with a natural colored lipliner that's closest to your lipcolor. 3. Apply your lipstick using a lipbrush for more precision. 4. Blot lips unto tissue. 5. Apply a thin layer of translucent powder over your lips to "set" the lipstick, then apply color again and gently blot with tissue..
How about you? What's your fave RED lippie? I'm still looking for the perfect pigmented RED gloss! Let me know if you found one.. I love red lippie! My favorite one is Cinema Secrets rip roaring red 32 (lips for love scenes I think) and my 2nd one is... Revlon copperglaze brown. Hm you might want to try the MAC lipglass in Russian Red. It went on very pigmented on me and I love the color. Trouble with it is that it's absolutely beastly when it's windy. LOL I get red streaks all over my face. @ Chrissy - Is the Revlon Glaze longlasting? @ Ida - thanks! have you tried Maybelline's watershine in Glazed Red aPPLE? Its not a vibrant red. I think this shade will suit you.